Downhill skiing is a physically demanding sport, even for the youngest skiers. Choosing the correct size of skis for a child helps your child control movements, making skiing both fun and safe. Knowing your child's height and weight helps you determine the right size downhill ski. The Children's Hospital of Pittsburgh urges parents to resist buying skis that their child will grow into, as oversized equipment can lead to injury. If you're uncertain, err on the side of caution and select a shorter length. Select a ski based on age. Children under 6 require skis that balance for their lower center of gravity, so need shorter skis. Children 7 to 12 can control longer skis. Stand your child in front of you and have your child hold the ski. Children 6 years of age and younger need skis that fall below their chin. Children 7 to 12 need skis that fall mid-face, but no higher than their forehead. If you don't have the skis with you, measure these distances using a tape measure. Select a ski with bindings that lock the heel in at all times. 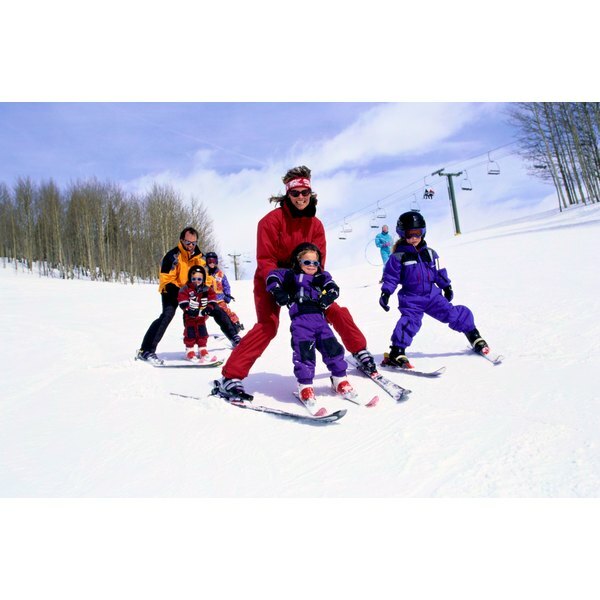 Alpine skiing using lifts to groomed runs doesn't require that your child's heels float free. In general, your child doesn't need poles. If your child is just learning to ski, poles can be dangerous and distracting.